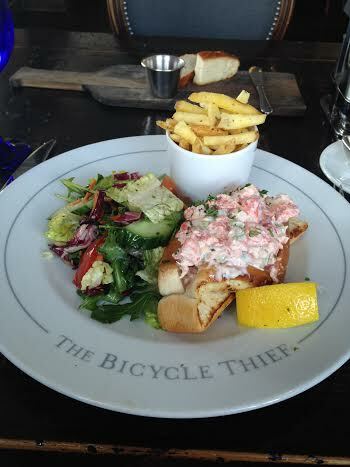 I woke up the next morning with two items left on my list: to have a lobster roll and hit a “You gotta eat here”. The weather had changed from an east coast storm to a cold, still day. Some of my colleagues who got in earlier in the week had gone to dinner at the Bicycle Thief (which promises offers North American food with an Italian soul) and raved about the experience. I checked out the website and was pleased to see a lobster roll featured prominently on their high gear menu. I also recalled a friend of mine fondly reminding me that the best calamari she ever had was on a Halifax pier and since this restaurant overlooked the water and featured flash fried squid as an appetizer, all was good. I’m not sure of the origin of the name of the restaurant but I suspect it may be a reference to a 1949 Italian movie of the same name which scores a impressive 98% on rotten tomatoes. Or maybe people just like stealing bikes along the pier. I skipped out at lunch and took the 5 minute walk to Bishop’s landing and was seated near the window overlooking the harbour. I gave the menu a quick glance already knowing what I was going to order. Shortly after, a slightly awkward waiter arrived and took my order. 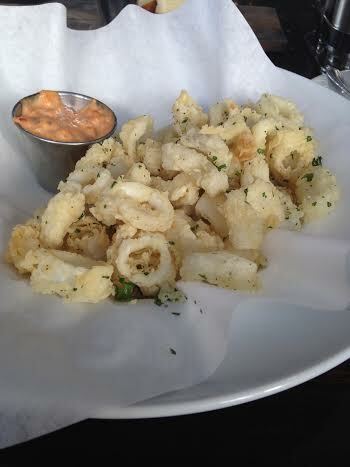 The two-minute flash fried calamari ($9) arrived a lot longer than two minutes later. It’s appearance was a bit anemic and it’s taste was the same. Even with the aioli, it lacked punch and the promised garlic was a little underwhelming. The squid itself was surprisingly chewy given the short fry time but this was likely due to the thinness of the cut. The lobster roll ($19) was delivered shortly after on a plate which had the name the of the restaurant proudly displayed on the rim (which as I mentioned in a previous blog seemed to be a Halifax thing). The roll itself had that pleasant and nasty wonder bread taste which was generously stuffed with the sweet, sour and crunchy lobster mix. The fries and salad were sleepy sides which did very little to enhance the plate as a whole. Later that night I attended a group dinner that was part of the conference. On the map, the Royal Nova Scotia Yacht Club seemed like a short jaunt but the need to navigate the Halifax peninsula turned it into somewhat of an adventure. The driver got lost and it took nearly 30 minutes to get there. The God awful temperature in the bus when combined with the winding roads lead a bunch of nurses I was on the bus with refer to the vehicle as the “menopause bus”. As a result of the travel induced hot flashes, most of us were ready to vomit by the time the doors opened and I had a new appreciation for the trails of tribulations of a 50 plus year old woman. Those with no familiarity with the Maritimes would picture the Royal Nova Scotia Yacht Club as a posh hamlet with a snooty clientele donning ascots and smoking jackets. This couldn’t be further from the truth. Instead, it was more like a rustic clubhouse that smelled a little like gramma’s house. This was one of those dinners where you pick your entree in advance and have the choice between fish, beef or chicken. Although haddock is a bit of a poor man’s fish which is often used a as cheaper alternative to cod or halibut in fish and chips, I was told to always order fish on the coast since cows and chickens tend to avoid the ocean. The fish arrived hugging 3 or 4 ounces of fresh lobster including a claw. I can’t imagine anywhere else on the planet where this would simply be called “haddock”. In the eyes of a Maritimer, lobster is simply “the other white meat”. After a double hit of lobster and a good night’s sleep, my only objective on day three was to hit a “You Gotta Eat Here”. A quick look at the map indicated that Bonehead’s BBQ was only a few blocks away. I walked over, knowing I was getting close when I could smell the air filled with the sultry scent of smoked swine. It was a small place with a few tables and a takeout counter which overlooks a small kitchen. The staff appeared to be lumbersexuals; a term to describe those with a rural, rugged look yet (usually sporting a beard) but at the same time adhere to a urban lifestyle. I ordered the white trash fries ($6.99) which were fresh cut fries topped with thick sausage gravy. Lumbersexual number two threw down a pan and made the gravy to order which I found most impressive. They were nasty and I mean that in the sense of feeling like you’re doing something wrong but it seems so right. I would have preferred a crumbled sausage instead of the kielbasa style pieces used in the gravy but it had all the elements of a good, greasy and naughty experience. 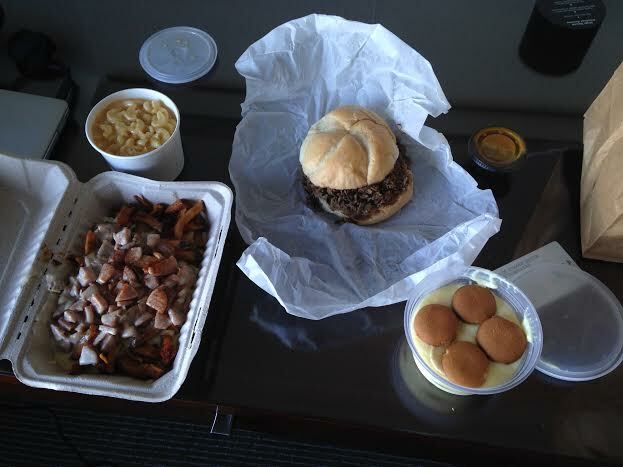 I also ordered a brisket sandwich ($6.99) and a side of mac and cheese ($3.50). The brisket itself was not mind blowing but still had was reminiscent of some of the good, southern smokehouses. Mac and cheese is like a banana; it has the ideal consumption window of a few minutes. As much as I like a good pot of Kraft Dinner, I fail to be impressed when it falls below a tongue burning temperature. Like the white trash fries, the mac and cheese was made to order so it arrived and stayed hot, keeping its flavour which I would probably put in the top third of mac and cheese that I’ve had. For dessert I grabbed a banana pudding ($4.25) that was nicely packaged in a plastic take out container and complimented with nilla wafers. Honestly, it tasted like something made from a hand mixer and an endorsement from Bill Cosby (before he went from Cliff Huxtable to America’s not so friendly sweater wearing dad and possible dirty old man). I was successful in my attempt to complete my bucket list during my short visit to Halifax. Day two involved a lobster roll with awkward service at a place named after a 16 year old bully and a sickening bus ride to gramma’s house to eat unadvertised lobster hidden under a slab of haddock. Day three involved eating southern food in the east prepared made to order by friendly lumbersexuals who know less about wood than Bill Cosby. Halifax is a quintessential Canadian city with amazing people, a small town mentality, branded plates and an attitude which shines despite bombardment by east coast weather, economic woes and bad curling teams. Although it’s food will not likely top the national ranks, it has great local pints, pays respect to the almighty lobster, owns the Canadian donair and makes eating pizza on a street corner a drunkard’s after hours tradition . Does it git any better?